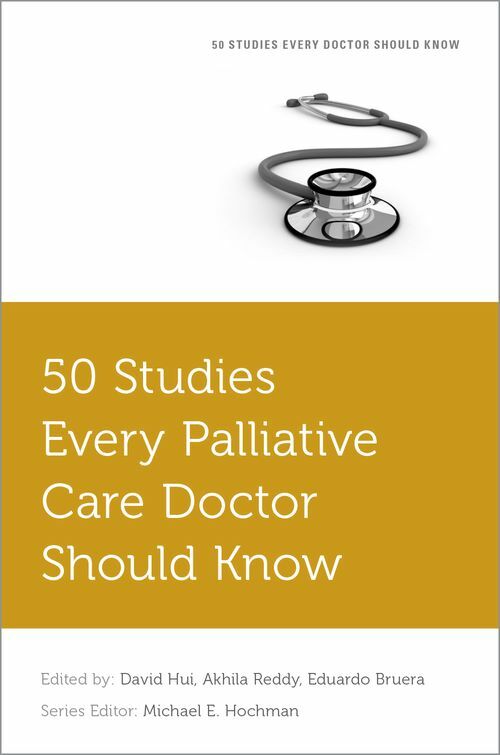 50 Studies Every Palliative Care Doctor Should Know presents key studies that have shaped the practice of palliative medicine. Selected using a rigorous methodology, the studies cover topics including: palliative care, symptom assessment and management, psychosocial aspects of care and communication, and end-of-life care. This book is a must-read for health care professionals and anyone who wants to learn more about the data behind clinical practice. Dr. David Hui, MD, MSc is an Associate Professor in the Department of Palliative Care, Rehabilitation, and Integrative Medicine, with a joint appointment to the Department of General Oncology at The University of Texas MD Anderson Cancer Center, Houston, Texas. He completed his medical oncology training at the British Columbia Cancer Agency in British Columbia, Canada, and completed a palliative oncology fellowship at the University of Texas MD Anderson Cancer Center. His research interests include integration of supportive/palliative care into oncology practice, clinical trials investigating interventions for symptom control, and prognostication. ; Dr. Akhila Reddy, MD is an Associate Professor in the department of Palliative, Rehabilitation, and Integrative Medicine at The University of Texas MD Anderson Cancer Center in Houston, Texas. Her research interests include opioids, opioid induced neurotoxicity and pain management in cancer patients. She has authored several publications determining safe and effective opioid rotation ratios for pain management in cancer patients. ; One of the pioneering members of the hospice and palliative medicine movement in North America, Dr. Eduardo Bruera, MD has educated generations of hospice and palliative medicine clinicians. Founder of two of the leading palliative care programs in North America (in Edmonton, Canada and The University of Texas MD Anderson Cancer Center), his impact extends far beyond his direct trainees, many of whom have gone on to lead programs of their own nationally and internationally. Mentor to innumerable observers, visiting scientists, and mentees, he has contributed to the development of hospice and palliative medicine clinical and research expertise across the globe. A prolific physician scientist and sought after speaker, he has created an enduring legacy for the field.